The recent bus crash in Atlanta left me thinking about how our state Department of Transportation does the bare minimum for safety, and there are a couple of troubling spots on a popular route that it seems to have no intention of properly fixing. At the site of the bus crash on Interstate 75, the bus drove full speed past over minimal pavement markings and past stop warning signs on an exit ramp. Even though there were previous fatal collisions at that exit, it took the bus tragedy to prompt the DOT to consider more markings, bigger stop signs, and barrier signs marking the overpass wall. 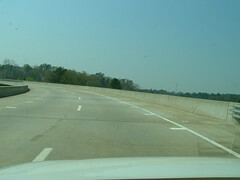 In the Athens area, the DOT could simply do more to help accident prone spots on the Epps Bridge Parkway-Georgia Highway 316 route. First of all, the Athens-Banner Herald has covered problems at the Epps Bridge Parkway ramp where the highway begins at the exit from Atlanta Highway. Two motorists have died after their vehicles left the bridge after attempting the curve too fast. The DOT's solution was to paint a series of pavement markings spaced closer and closer to create the illusion of speed to trick drivers into slowing down. My guess is that this is a lot cheaper than installing delineator signs on the bridge, the yellow signs with black stripes or chevrons that warn drivers of curves. If you look at this bridge, you will see the markings where the vehicles struck the wall and left the bridge before any of these signs begin. After the bridge, these signs have been placed to mark the rest of the curve. Why can't the DOT simply install these signs on the bridge itself? 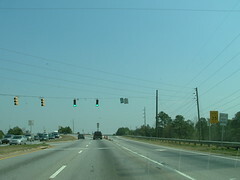 In Oconee County, Highway 316 has an interchange with the Perimeter Highway. The westbound side has an exit lane for entering the outer side of the Perimeter. Unfortunately, this lane is only separated by white rubber posts about two or three feet high -- the kind that are designed to fold down and be driven over -- and there is an intersection where traffic leaving the outer perimeter turns left or right onto 316. This intersection is accident prone because it is not very clear to exiting traffic that the right lane is blocked off, and drivers are prone to entering this lane either because they do not realize it is an exit lane or they do not understand they cannot use it to reenter the Perimeter. Traffic in that right lane does not stop because it is not supposed to, so this is extremely dangerous. Despite all the money that has been available to build the nearby Oconee Connector, cut off roads that intersect 316, and close crossings over 316, the DOT did not have the money to properly separate those lanes. Not only that, but they are not replacing the white rubber poles that are saving them so much money to begin with. A new cultural center called Athens Ciné will bring a variety of cinematic features downtown. This new place featuring a bar, café, and movie theaters will show independent films, foreign films, classics, and documentaries. Espresso and wine will be served in front of the theaters in a relaxing space framed by the historic interior structure of the former Snow Tire retreading facility at 234 West Hancock Avenue. A large room called the Ciné Lab will serve as an art gallery and reception space. Does it sound overwhelming? It is certainly intended to be more than a movie theater. One might question the viability of a makeshift effort to show art films, but here Brigitta Hangartner has invested her heart and soul (and lots of money) into a facility that will provide a permanent focal point for the area's film community. When I recently had the chance to take a tour and sit in on a meeting of new volunteers, I had the sense that I was watching history take place -- the instituting of a new Athens institution. Historic preservation is a religion in the new cinema. Many of the existing features in the building have been preserved either to record history or for the sake of curiosity. For instance, you will know the place is closed if the garage door is pulled down in front of the box office! An enlarged print of a tire tread is preserved in the entryway. Inside you will have a clear view of the arched roof common to many of our older local structures. There is a tin ceiling and skylights. Of course, the old surfaces have been cleaned and repainted; the brick and old paint is still visible in the projection booths, but a sealant has been applied to keep paint flakes off the film. Modern features have been added, though, such as the concession counter. You know you're in the right kind of place when it has a butter dispenser and an espresso machine! This main space is conducive to conversation with a few tables and a banquette installation from Didi Dunphy, a designer known for a "playground" style. I mentioned the volunteer meeting. (We're talking about people helping the cinema, not Tennessee.) The Ciné is looking for volunteers to serve as ushers or event facilitators or to even help with promotions. This is an artistic project that benefits from volunteers; it was even partially funded by a grant but is not exactly classified as a nonprofit operation. There will be a paid staff to operate the projectors, box office, and concession counter, but it will depend on the film and art community to operate. Contact Ciné if you are interested in volunteering. The two theaters were built new as additions to the building, and it was fortuitous that the ground already sloped downward in the rear. One theater, trimmed in blue, has 135 seats and a stage in the front; it is served by two 35 mm projectors. The teal theater has 105 seats and is served by a 35 mm projector and a digital projector; it can be rented for private occasions showing DVD or computer-based presentations. Acoustic features were given special attention: the walls and ceiling are fitted with acoustic tile, and the wall between the theaters was built to a strategic height above the roof. A lot of people experienced in the arts, film, and academica are running the show. Film selections will be diverse but meaningful, perhaps to be introduced by professors or the filmmakers themselves. The opening schedule is not finalized, but the cinema is set to open on April 2. Expect a big schedule covering weekends and weekdays with matinees, evening shows, and maybe midnight shows. By the way, a restaurant will occupy the space in the front of the building in the near future. Film Athens is calling for entries in the Sprockets Music Video Competition to be exhibited as part of the annual AthFest on June 20. Winners will awarded at the Flagpole Music Awards ceremony. The early deadline is April 15, so bands and filmmakers get ready soon. Visit the website to see the video archive or get information about the TeenScreen film festival. You'll also learn about the Sprockets blend of coffee. "The A List" is a new weekly television show covering musicians and music venues, and it is in the works from Andrea Griffith, creator and host of "Georgia Life & Style." It is expected to premiere sometime soon in Athens and other cities in the region. Andrea will go behind the scenes with singers and songwriters to learn about their inspiration and rising careers. Expect to see coverage of Jessica Urick, Gator Bressmer, Ralph Roddenbery, Tim Brantley, and Heidi Hensley. Stay tuned for updates.